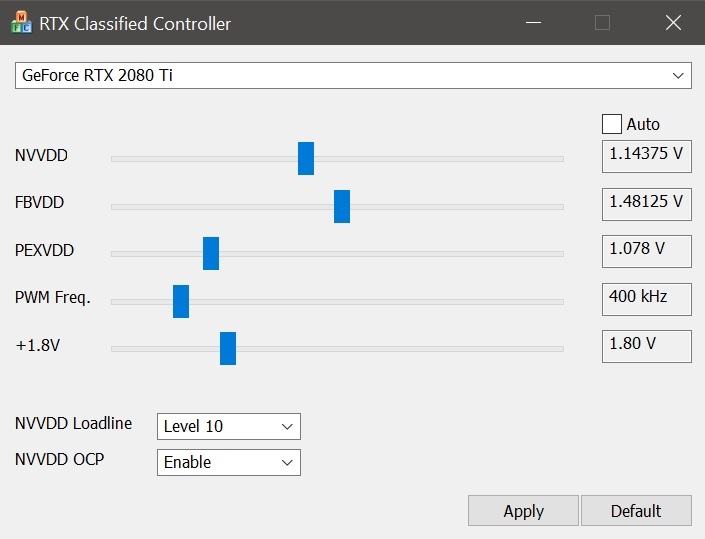 my RTX Classified Controller settings, used to benchmark 3DMARK PORT ROYAL 9501 score. NVVDC 1.15000 V (range .65 -1.5) Tin noted 1.5V on stock cooling is NOT safe! Did the Loadline setting help stabilize your settings? Wasn't sure quite what it was. I assumed this would be acting like LLC on a CPU OC. i wasnt sure either so i just applied it and it worked. 1.5V on stock cooling is NOT safe. Your right i should change my wording. i watched my temps very closely, and kept it at or under 60.0 Celsius. What do you think your cards can handle safely on stock cooling? I am running 1.15V on stock cooling with a low ambient room 20c. Thanks for your input, its reverence. Overclocking and benchmarking is a challenging and entertaining learning experience. For Classified settings, I used 1.143-1.15v NVVDD. FBVDC 1.485v. PECVDD moved 1 notch and back. Didn't affect anything pos-or-neg. PWM 700. LLC 5. Vince was saying up to 1.50v FBVDC is safe for short benching sessions at ambient. It can help stabilize higher clocks but you'll find extra voltage on the memory can lead to extra heat and temps which in turn reduces stability. There's an easy to hit negative scalling on memory at ambient temps. But every card will be a bit different. Thanks, I will keep mine below 1.480v on the FBVDC then if I even use this tool. These cards I tell you, 1.093 1.4 gpu +116 Mem +1350 and my boost clock is at 2160 also, any benefit to bumping mem voltage and or nvvdd? LLC, or the droop level, has a setting in Classified and two switches on the back of the board. They have much to do with stability of clock and with the voltage setting needed. I'm still playing with them and don't have answers I can suggest, but the sensitivity to droop is something that can't be ignored. 5000MHz on Auto is the best it seems but do not care for the High Voltage. But then this is what I got all this for after all. if you try these setting, i recommend you step your way up, if not you may experience artifacts like crazy. i didnt hit apply, on the "candy tool" in the picture, thats why my voltages look so low. You are showing 330 because you have the Default settings in the NVIDIA Control Panel? Bill, i edited the post did you see that. i just posted the pic as a deminstration, if i hit apply with out stepping up to that voltage i would artifact badly. 1.6 V on mem is my only way to get anything over 1500 mem stable.